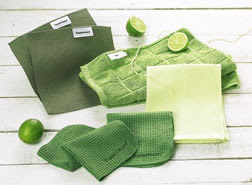 Did you know that Tupperware has a great line of microfiber kitchen and cleaning items? If you didn't, then I think you would be pleasantly surprised with the high quality microfiber items that Tupperware now carries. 1. Tupperware Microfiber Dish Cloth Set is sold 2 per package. They each measure 8" square so they are a nice size. 2. Tupperware Microfiber Kitchen Towel measures 15x15" in length, a nice plush microfiber over-sized towel for use in your kitchen. 3. Microfiber Window & Mirror Cleaning Cloth will leave you glass and mirror surfaces clean and streak free. Each cloth measures 16" squared. 4. Microfiber Stainless Steel Polishing Cloths are sold 2 per package and each one measures 10" square. Perfect for cleaning stainless steel appliances with just tap water and it leaves them streak free! 5. Tupperware Microfiber Dusting Mitt (not show in photo) will clean surfaces in less time, wet or dry. Reusable mitt grabs dirt and dust from TV or computer screens, mini blinds, furniture and more. I personally own and use each of these products and love them! You will help to save the environment as you are only cleaning with water plus as an added bonus, you will cut down your cleaning time.